Vitalii came to Latvia on 18th of January 2016 to treat lower leg that had been crushed by bullets shot by Russian soldiers on 31st of May 2015: in an indubitable Ukrainian territory Vitalii along with other soldiers of his brigade were attacked by Russian army unit for sabotage and intelligence. Vitalii was lucky enough to get his face and eye cut with the windshield, so, control shot was done into the body rather than the head (bullet went through right arm, thoracic cavity, belly and got stuck in the left tight), but before the control shot Vitalii was already injured twice in his right leg. Vitalii’s life was saved and most of in juries cured in Ukraine, except wounds of right lower leg, as a complication to the nerve injury heel ulcer developed. 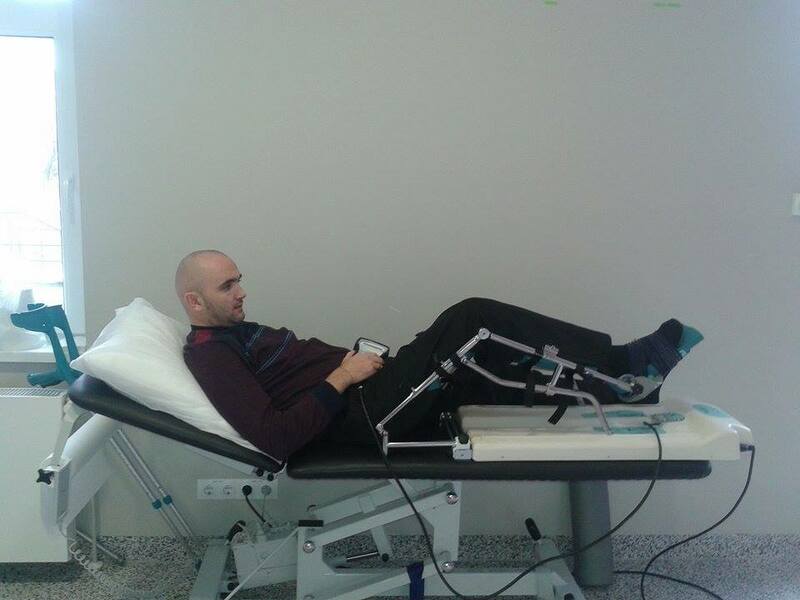 Vitalii was treated by the best Latvian specialists: Dr.Med. Mārtiņš Kapickis renewed nerves of lower leg that resulted in decrease of pain, renewal of feelings and curing of the ulcer. Dr. Mauriņ’ s Clinic of Laser Medicine (http://lazermedicinasklinika.lv) free of charge examined Vitaii’s blood vessels, gave him special vein stockings, regular wound dressings and treated him by pressure, as a result the leg cured faster and pain was lower. Clinic “Orto” (http://www.orto.lv/) – Dr. Andrejs Peredistijs and Dr.Alla Hohlova – consulted Vitalii free of charge and donated rehabilitation treatment for knee and ankle joints, renewal of correct gait and muscles. Vitalii left us for his wife and 9 years old twin daughters on 25th of February feeling much healthier than upon arrival and filled with realistic hope for renewal although bones of lower leg have not fully consolidated as yet. Vitalii will need a repeated consultation by traumatologist- ortopaeditian Dr.Peredistijs in a few months. Expenses to the Foundation for two operations, examinations and in-patient stay in the hospital – 1995.74 euros (huge thanks to Center of Microsurgery for 1340.89 euro discount which means that physicians of Center of Microsurgery worked for free); ticket from Kiev to Riga was free of charge (the symbolic 10 hrivnas were paid by Ukrainian volunteer Ivanna Porovska, Vitalii was able to come to us only thanks to her devotion and energy), but return ticket from Riga to Kiev was not free of charge (cost USD 142.63). Huge thanks (as always) to Latviann Embassy in Ukraine for help and visa free of charge. Analyses in EgilaGulbjaLaboratorija – 25.89 euro, medicine for treatment of nerves and paikillers – 67.26 euro (supplies will last a couple of months, total duration of treatment is more than a year), wound dressings – 54.73 euro, device for electrical muscle stimulation “Sport TENS-2” – 85.39 euro (spare electrodes cannot be purchased in Ukraine, these have been donated by Mrs.Galina Petrenko). Total expenses for Foundation are only 2361 euros due to the donation of Center of Microsurgery, clinic “Orto”, Dr. Mauriņ’ s Clinic of Laser Medicine, due to time, effort, fuel etc donated by private persons. Huge thanks to everyone helping us to help! We are also grateful to the anonymous private person who donated a laptop to Vitalii!